Kirsten speaks and writes perfect English and I know that she will be more than happy to answer questions about any of the various products she stocks, send her an email but do allow a few days for a response, she is a very busy lady! I need to get back to my current work RIGHT NOW (deadline approaching!) so will finish blogging about this brilliant printing workshop next time, promise. 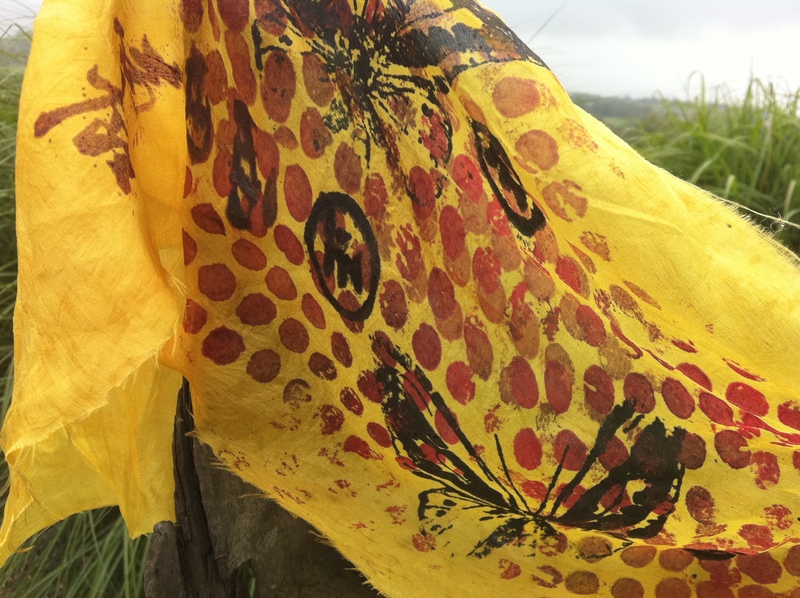 The second workshop that I participated in at Felt in Focus was brilliantly facilitated by Kirsten Lundbergh, ‘Print, Paint and Reserve on Silk for Nuno Felting’. 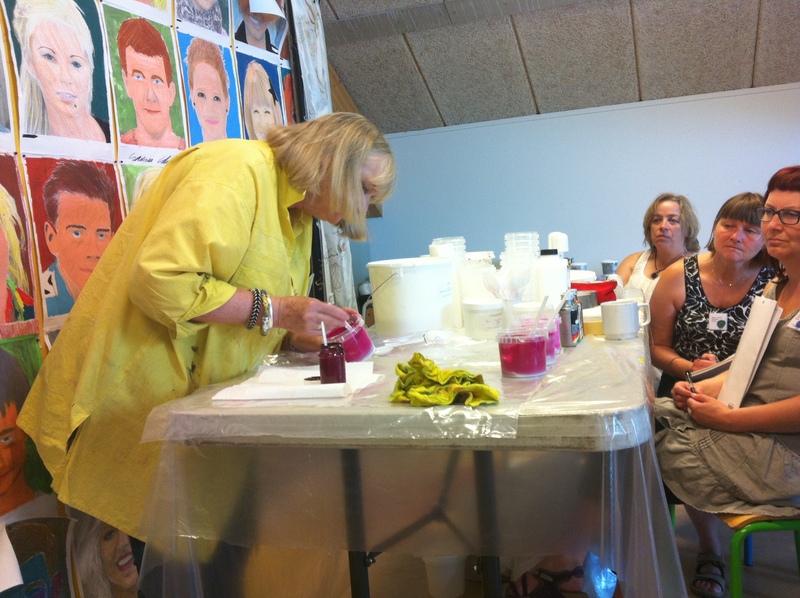 In my innocence I somehow arrived to this two-day workshop with the idea that we would be printing with acid dyes, duuh, Kirsten soon put me right!!! We started the first morning getting to know a little bit about Kirsten’s background, really this deserves a whole post to itself but in a nutshell this is an amazing story about quitting a large and successful printing/dying business to spend 13 years teaching women living in remotest Africa (several hours from any electricity, water or facilities) how to dye cloth using simple environmentally friendly methods then showing them how to start micro businesses and bring their product to market. I found this an absolutely fascinating and inspiring story, it also made us all realise that with the barest minimum of materials and facilities everyone should be able to print successfully without causing any harmful damage to the environment or society. As a result of this experience all the products Kirsten works with herself and sells through her current business are totally non toxic to use. It’s very refreshing to know that when working with children and indeed students no special precautions need to be made when printing, very refreshing also if you do tend to be a bit glib like I am! Moving on from Kirsten’s background we learnt a little about the pigments and binders we would be using. These binders are the base to which pigments are added prior to printing or painting on your chosen fabric, my presumption re acid dyes had already flown out the window by this stage!!! Depending on the end result we wanted to achieve there were different binders for silk, cotton, adding an opaque colour, transparent colour, opalescent colour, solid white etc., etc., etc. as well as glue type binders to aid transferring image from print to fabric, magnetic foils, the list goes on and on. One of the most fascinating was a binder that allows you to print designs (either with or without colour) onto the fabric thereby creating a resist and then when nuno felting no wool can migrate through these areas, the second binder I fell in love with is made exclusively for Kirsten’s and means you can print on silk without altering the structure of the fabric at all, wonderful!!! 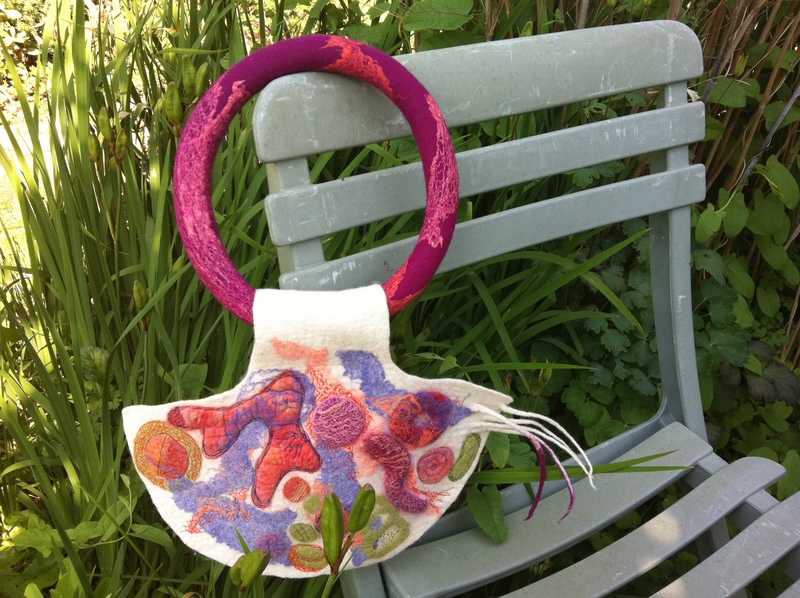 More anon …..
Another few days have gone by since I promised to post more pictures of the pieces I worked on at Lisa’s felt jewellery workshop, time just seems to be running as fast as ever so sorry if any of you have been waiting. I had debated a variety of large neckpiece options but finally decided on an oversized ‘pendant’ to be worn either on a thick felt torc or with a scarf wrapped through the bail, a new word I learnt and you can check out the meaning here if you don’t already know it too! Because my first piece didn’t have the shrinkage I was hoping for or expecting I did have to revise my ideas for the pendant, I still made it oversized but that’s OK, I like my pieces to make a statement!!! Unfortunately I didn’t ask anyone to take any pictures of me wearing it with my own camera but to get an idea of the scope of the project there is an image of me and my friend Birgit Kiems taken on the night of the gala dinner at Felt in Focus on Facebook, you can have a look at Birgit’s pictures here. Be prepared, it’s not the most flattering image of me, eyes half closed and tummy sticking out! Iam also in the process of uploading more images to Flickr, these show a little more detail of various parts of the free machine stitching, now that I am home I will also take some pictures of the torc minus the pendant. Thanks to Pardis and all at Living Crafts Magazine for giving Chrissie and I the thumbs up for our new book ‘From Felt to Friendship’ in the summer 2011 issue! Here is what they said ….. “This gem of a felting book is for those who are beyond the beginner stage and are looking for inspiration for more adventurous projects. It is written as a guide to encourage the more experienced felter to experiment and ‘play’ more freely. It is rich with many beautiful projects and diverse techniques.” THANK YOU!!! Here is a teaser photo from my main neckpiece completed during Lisa Klakulak’s workshop, more tomorrow! Thanks a bunch for all the positive comments about my first adventures into free machine embroidery, much appreciated. I really wanted to push myself with the workshops I participated in at FIF but wasn’t expecting to have so much fun with the sewing, ah well, it’s never too late to teach an old dog new tricks!!! 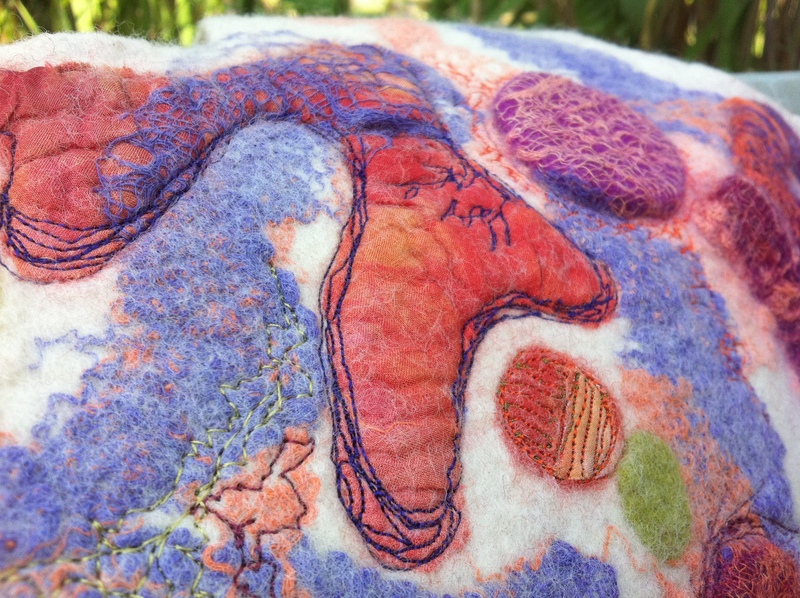 Lastly for today, don’t forget that I am facilitating a felting workshop at The Yarn Room in Ashford, Co. Wicklow this Saturday, the perfect way to release your creative inner spirit. 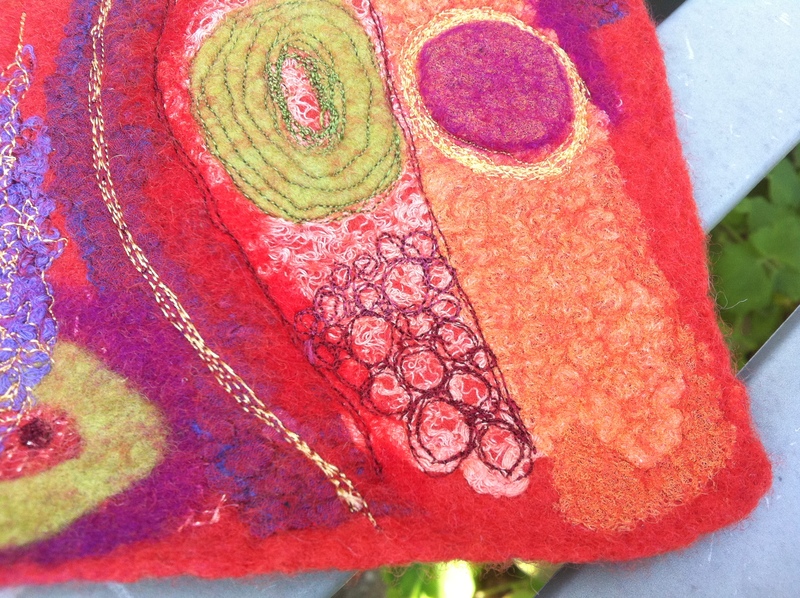 Why not pop along for a relaxing day of felting fun??? Textured and stitched, the addition of machine embroidery to felt adds another dimension! It is just not going to be possible to blog comprehensively about all the new techniques learnt and information absorbed at Felt in Focus, firstly there is definitely not enough time and secondly a lot of it is in my head and will be transmitted into my work over the course of the coming months. 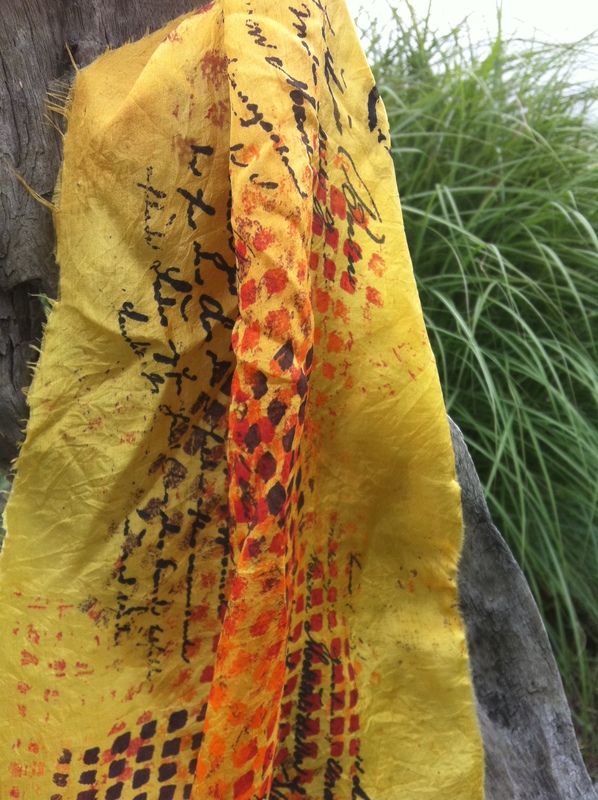 Instead I hope you will share with me as I post some images taken during the two amazing workshops I participated in, felt jewellery with Lisa Klakulak and printing on fabric (printing with pigments and binders and not with acid dyes as I had somehow imagined!) with Kirsten Lundberg. I’m going to start today by uploading two images of the first piece I completed at Lisa’s workshop, a richly coloured wall piece (that I originally intended to be a bracelet!) with areas of high relief, achieving textured surfaces is something that really interests me. 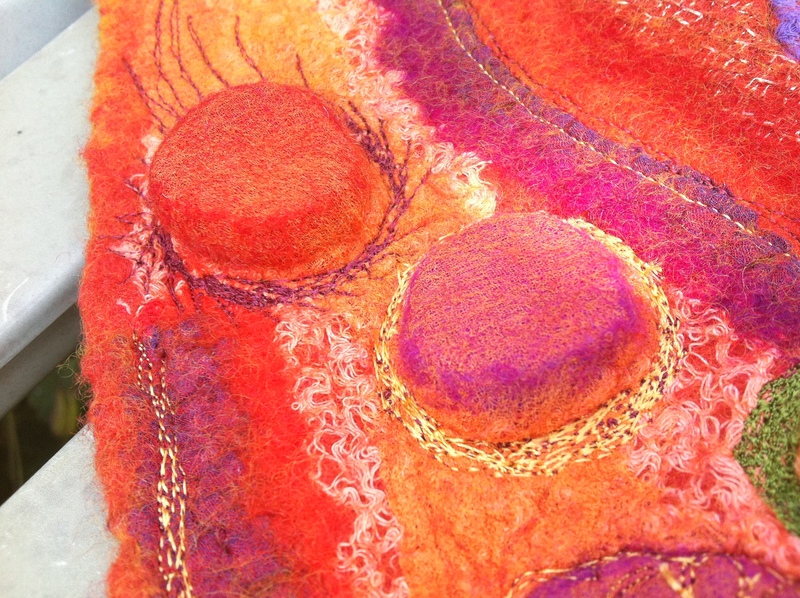 Seeing Lisa’s felt in reality was a wonderful experience, watching her demonstrate how adding free machine embroidery to various areas really opens up a whole new avenue for exploring different means of surface embellishment. As someone who has always had a horror of working on a sewing machine free machining was a total new experience, wonderfully relaxing believe it or not expecially since I was working on a relatively ‘free’ style of stitching playing around to see what sort of effects I might be able to achieve without totally stressing myself out about perfection! Felting in Roskilde this morning …..
It’s a beautiful warm and sunny morning here in Roskilde, Denmark so Kirsten and I have planned a morning of relaxing, felting and possibly a really short session of rust dying, heaven!!! I have so many ideas in my head after our wonderful week participating at Felt in Focus and can’t wait to share pics with you tomorrow morning from my own computer, I promise! The whole experience was really something special, obviously the workshops where we got stuck in with hands on tasks was the main reason for attending but the friendships renewed and created were quite special, this event has been so much more than just another chance to learn new techniques. Discovering new ways to end up with old results really did prove that there are many ways to skin a cat (sorry for the dreadfully graphic anaology!) and you definitely can teach an old dog new tricks. I think that I may have a way of making some of the protrusions on my vessels SO much easier to include but we’ll wait and see, plenty of experimenting to come over the next few weeks when I get a minute from finishing my work for the solo show I have during Kilkenny Arts Festival at the beginning of August.